Campfires are not permitted; observe posted signs. There are potentially aggressive moose in the area. Wild animals may be dangerous – please be considerate and do not approach. As a reminder, all dogs must be on a leash – this is to protect the dogs and all of the values in the park (including the safety of the animals who reside in the park). Please observe and follow all official signs by BC Parks. McConnell Lake is popular with fishermen and it is noted for rainbow trout to 1.5+ kg. BC Parks and the BC Wildfire Service are working year-round to minimize the amount of fallen trees across the Lakeshore Loop Trail (as per the direction provided by the Wildlife Danger Tree Assessor: Parks and Recreation Module). Please respect the signage and staff when they are carrying out this work in the area. The Lakeshore Loop Trail is 3.5 km in length. If you are enjoying the trail with your four-legged companion, please ensure he/she is on a leash and under control – we want to make sure this is a trail that everyone can enjoy. Please make sure to clean up after your dog, including bringing his/her waste out of the park – outhouses are for human waste only (not bags, diapers, garbage, etc.). The nearest public telephone is at the entrance to Lac Le Jeune Park, approx. 5 km away. 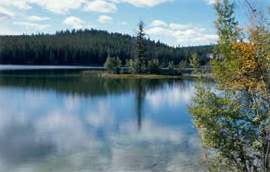 Take the Lac le Jeune Exit off Hwy #5; the park is 35 km south of Kamloops and 49 km north of Merritt. History: Through the LRMP McConnell Lake was established in 1996 as a Class “A” park; McConnell Lake has been protected as a Recreation Area for many years. Conservation: The park represents a typical plateau lake surrouonded by hilly forested uplands. There are Montane Spruce and old growth specimens of Douglas Fir. The riparian and shoal areas provide critical habitat and feeding areas for rainbow trout. Wildlife: McConnell Lake is noted for rainbow trout. McConnell Lake is popular with canoeists and kayakers. McConnell Lake contains 1.5 kg and larger rainbow trout. This is a regionally significant rainbow trout fishery. The lake is known for its clear water. Check fishing regulations. The lake is popular for ice fishing. Anyone fishing or angling in British Columbia must have an appropriate licence. There is a primitive trail around the lake. There are extensive hiking trails available at nearby Stake Lake. This area offers over 45 km of trails. There is no developed beach or swimming area. There are no lifeguards on duty in Provincial Parks. Informal snowshoeing can occur depending on snow levels and access. Cross-country skiing is available at nearby Stake Lake where there are over 45 km of trail. The lake is popular for ice fishing. Anyone fishing or angling in British Columbia must have an appropriate licence. There is a small gravel surfaced boat launch suitable for small boats. This is a small, quiet fishing lake. High speed operation of boats is discouraged. There is one cold-water hand pump available in the park. This is a very rustic day-use area. There is one picnic table near the boat launch. This park has one pit toilet – no flush toilets.